Supplementary feeding sheep with grain, hay or silage is necessary when pastures or stubbles are deficient in energy and protein. 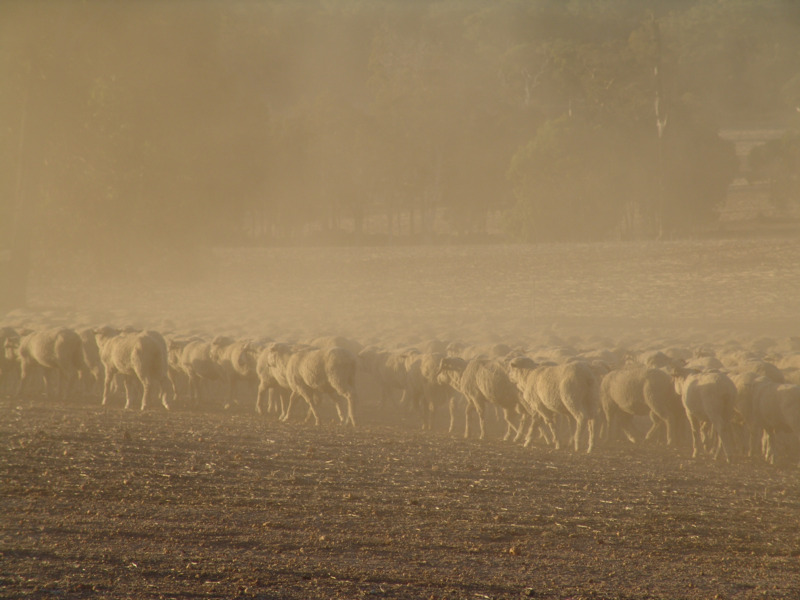 A good supplementary feeding program will ensure sheep utilise as much dry paddock feed as possible as well as provide sufficient supplementary feed for maintenance or growth. Supplementary feeding is the supply of additional feed (usually grain, hay or silage) to sheep grazing a pasture or stubble that is lacking in energy or protein. In Western Australia later in summer and autumn, supplementary feeding often becomes substitution feeding where sheep choose to eat the added feed rather than that available in the paddock. Supplementary feeding aims to meet the nutritional requirements of different classes of sheep. It is especially important to prevent excessive liveweight loss during the dry pasture phase in weaners and pregnant ewes. If you are growing sheep for meat production, seek professional advice regarding ration quality and the energy to protein ratios in the supplement. See the sheep feed value guide for more information on nutrient values of different feedstuffs. reduce the grazing pressure on establishing pastures to ensure that pasture growth rates are optimised in winter. Improve utilisation of dry pasture or stubble – which is low in protein and high in fibre – by supplementary feeding with 20–50 grams per head per day of a supplement high in protein, such as lupins. digestibility needs to be at least 50–55%. Providing high rates of feed (more than 100 grams per head per day) will lead to substitution, where the sheep choose the supplementary feed over pasture, leading to reduced pasture utilisation. When pasture digestibility falls to less than 50%, energy becomes limiting for maintenance for all classes of sheep, and feeding protein will not aid further utilisation of dry pasture. Use high-energy supplements to maintain sheep once pasture digestibility and quantity have fallen below 50% and 1500kgDM/ha FOO, respectively. if feed availability is less than feed requirements, determine how much supplementary feed is needed. Watch the video below for an introduction to all aspects of feed budgeting. We recommend watching the video in YouTube to see the tables. Most values given for feed requirements are based on a medium-framed Merino of 50kg mature weight in good condition with no fleece. This is commonly referred to as the sheep’s standard reference weight. If sheep are of a different frame size or condition, their requirements will need to be adjusted. It is important to remember that the energy requirements of sheep will also vary with the feed quality they are eating, the amount of walking they are doing to find the feed, their current status of nutrition, and for ewes, whether they are dry, pregnant or lactating. The tables below are guides only. Do regular condition scoring – or weighing – of the flock to determine if the feeding rates are adequate for their needs. Sheep that do not produce wool have a 2–3% lower requirement to maintain the same weight. Spend some time and effort to manage ewe energy needs. The reproductive ewe has the most variable feed requirements of any class of sheep, and the consequences of her needs not being met have the biggest impact on production in the sheep enterprise. The ewe’s energy requirements increase slowly over early pregnancy and rapidly in the last 50 days before lambing. Lactation greatly increases energy requirements, and peaks at around 25 days after lambing. Ewes in late pregnancy also have a higher requirement for protein, and should be fed a diet containing more than 15% crude protein. Weaners need to keep actively growing to stay healthy: they should be growing at least 50 grams per day (g/d). Weaners that will be turned off for slaughter will need to grow at rates above 150g/d and many growers aim for more than 250g/d to reach slaughter targets. Ewe weaners to be mated as older lambs will need to gain as much weight as possible before conception. Most areas of Australia report mortality higher than 6% in 20% of flocks: this is poor animal welfare. Income is lost through fewer replacement animals. There is a lower sale turnoff and poor production in the remaining animals. enough energy to meet the requirements for weaners of varying current liveweight, age, expected mature weight (Table 3) and environmental conditions, such as weather, the quality of the pasture being eaten and how much walking it requires to graze. How do I work out feeding rates? The Lifetimewool project website has some easy-to-use feed tables for the ewe flock. Use the department’s Supplementary feeding calculator for pregnant and lactating ewes at the break of season. During the dry phase, pasture quality does not give an accurate picture of how the sheep will perform. The only practical way to achieve your sheep production objectives using supplementary feeding during the dry is to regularly monitor your animals (weighing or condition scoring) to determine whether the feed is adequate for the targets you have set. After the season has broken, sheep will choose to eat the available green pick in preference to the dry pasture. Until green FOO is greater than 700kgDM/ha, sheep will need to be supplemented to maintain condition and to protect the establishing pasture (refer to 'Defer grazing' for more details). Once green FOO has reached 700kgDM/ha, sheep will tend to eat pasture and leave the supplement, so continued supply of supplement will be wasteful. Use the supplementary feeding calculator to determine feeding rates required for ewes. How do I choose the right supplementary feed? The type of supplement to use depends very much on the energy and protein requirements of the sheep, availability, cost and convenience. We recommend you test your supplements (grain, hay or silage) for quality. Metabolisable energy, protein and bulk density are all variable and important in determining accurate rations to satisfy production objectives (maintenance or growth). You can test your feed for energy and protein, or use a table of common feed values. Find out more about feed values of common feeds on feed values for sheep. Use the feed cost calculator to determine the cost of the feed per energy unit in megajoules or protein. The calculator also allows you to choose a feed mix and view the energy and protein levels, and cost of the mix. at least 9% protein is needed for survival. Feeding sheep for maintenance can be carried out in the paddock as a supplement to pastures or stubbles, or as a complete ration in the paddock or in a confined area. Rations are usually in the form of whole grain, hay, pellets or a mix of these feeds. The grain and roughage portions of a ration can be offered together in a trough, or the grain in troughs or on the ground and the hay either on the ground, or preferably, in a hayrack. When introducing a new feed to sheep, feed every day. After this introductory period, the ration can gradually be fed out less frequently (see guidelines below). If sheep are fed daily each feed amount is small and dominant animals will eat more than their share at the expense of smaller, weaker animals. Research has shown that there will be a more uniform liveweight across a mob and fewer losses, if sheep are fed less often. early weaned lambs – feed ad lib until they reach 20kg liveweight, then feed every second day. If possible, feed the roughage before the grain so that all sheep get some roughage. This also reduces the risk of hungry sheep overeating grain resulting in acidosis. Cereal grains generally form the basis of a ration or supplement because they are high in energy and are usually readily available. Most cereal grains have an energy level of 10–13 megajoules per kilogram of dry matter (MJ/kgDM) and contain 5–15% crude protein. Vaccinate sheep before introducing high starch diets to reduce the risk of pulpy kidney disease. Cereal grains pose an acidosis risk as a result of their high starch content. Cereal-based diets or supplements should be introduced gradually over 10 to 20 days (depending on the feed and situation) to allow the rumen time to adapt. Refer to Table 4 for an example introductory schedule for a maintenance ration. The descending order of risk of acidosis is wheat, triticale, barley then oats, where oats are the safest grain to feed. When introducing maintenance rations, allow at least 10 days for oats and low energy pellets and 14 days for wheat, barley and triticale. Even changing from one grain to another should be carried out slowly over 7 days. Oats or sheep pellets can be introduced to sheep (depending on their cereal grain or energy content) 5 days faster than recommended in Table 4. If sheep have been grazing stubbles with grain on the ground, introduction can be 3 days shorter at the early stages. Table 4 Example daily rations of wheat, barley or triticale per sheep (grams per day) when introducing cereal grains. Note: asterisk (*) denotes the need to be extra vigilant at this time. Seconds grain can be a useful inclusion in mixed rations because they are generally higher in crude protein and have less starch than fully formed grains. This may mean that you can reduce the amount of lupins included in the diet, particularly if you are feeding lambs. It is very important to have the protein and energy level tested because they are likely to have a variable nutrient content due to the degree of pinching and the presence of weed seeds. Seconds grain should be introduced gradually because they still pose an acidosis risk. Lupins are a good source of protein and have the advantage of a high energy content, a very low level of starch and a high level of fibre. This means that lupins pose a lower acidosis risk than cereal grains. It is still important to gradually introduce lupins to sheep because the sudden introduction of high amounts of lupins to hungry stock may result in ammonia toxicity. Lupins are low in sulfur which can upset the ratio of nitrogen to sulfur. To overcome the imbalance, a mineral supplement containing sulfate or sulfur (for example, gypsum) can be added to the diet. Lupins often seem relatively expensive compared with other grains on technical feed value, but in practice they punch well above their weight and perform better than other grains in a paddock situation. Also, lupins are nicely packaged so there is less waste in feeding them. The major advantage of lupins is in saving labour. They can be fed out infrequently as long as the same total quantity of feed is presented to the stock over the same time. This is because lupins do not contain starch and therefore they do not cause digestive upsets. The time between feeding lupins can be as long as 3 weeks, but usually once a week is best. the feed seems to last longer. Beans, peas and vetches contain a high level of energy and protein. They also have a high level of starch, which means they pose an acidosis risk. They need to be introduced slowly and fed at least twice a week to prevent acidosis. Sheep may take some time to adapt to these feeds if they have not been exposed to them before. Canola seed is also high in energy and protein. However, there are 2 problems associated with canola in a ration. Most seed will tend to pass through the sheep undigested because of the small seed size and lignified seed coat. The other problem is that the oil in whole canola seed, when released in the rumen, can coat the fibre in the gut and reduce the efficiency of digestion. Canola can, however, be utilised quite well by sheep if it is coarsely cracked or milled. Canola seconds are generally of lower oil content and contain more protein. Using pellets can be convenient. In most cases, pellets provide a complete ration, ensuring that all sheep receive a balanced diet because they cannot select the individual components. Pellets are designed for a range of purposes from maintenance through to production. Obtain the nutritional analysis from the supplier and decide whether the pellets are appropriate and good value. Some pellets are high in energy and pose an acidosis risk, just as grain does. Other pellets are lower in energy and have a lower risk. Check the level of fibre in the pellets and ask the manufacturer whether the pellets should be fed with additional roughage. Calculate the cost per unit of energy and include other costs such as transport. Ask the manufacturer the best way to store the pellets to give them the longest life possible. If the pellets are hot when stored, they can go mouldy. Clean out the silo and ensure there are no grain pests present. Sheep being fed in a confined area need at least 10% roughage in the diet to keep the rumen working effectively and to reduce the risk of acidosis. Lactating ewes require at least 15% roughage to ensure they can produce sufficient milk for their lambs. Use higher rates of roughage at the start of feeding, when changing a ration, or at other times of risk, such as at times when intake may be low, for example in a cold spell. Roughage alone may not provide the nutrients required by all classes of stock and may be more expensive per unit of energy or protein compared to grain-based rations. The nutritive value of different roughage sources is highly variable and difficult to estimate, so it is recommended that the energy and protein be tested before planning a feeding program. Note: the maximum daily dry matter intake is 2–3% of bodyweight for poor to average quality pasture or hay, and up to 4% in a feedlot on high digestibility feed. Intake of low digestibility roughages may reach the intake limit before reaching the metabolisable energy needs of the animal: in that case, animals will lose weight. When deciding on the best feed to buy, calculate the cost of the feed based on an energy basis (cents per megajoule) so that the costs of different feed sources can be compared. Silage is generally of a greater nutritive value than hay (per kilogram of dry matter) because it is made at an earlier stage of plant growth when energy and protein are at higher levels. Silage made from pasture or cereal crops can range from 8.5 to 11 megajoules of metabolisable energy per kilogram of dry matter and 7–25% crude protein. Grass-based silage will maintain sheep but generally not provide an adequate diet for animal production. Silage made from a mixture of cereal and legume crops will contain more nutrients and so may support production (growth) without additional grain. Hay for sheep is usually made from cereals, sometimes with a mix of cereals and a legume component (vetches or peas), and less commonly from pastures of grass and clover mix. Hay is an important source of roughage, it is bulky and expensive to transport so other feed options may offer better value. When you buy hay, purchase it by weight because bale weights can vary greatly. Early-cut cereal hay has moderate digestibility (55–65%), moderate metabolisable energy (9–10MJ/kgDM), and moderate crude protein levels (7–12.5%). Late-cut cereal hay usually has the lowest digestibility (50–55%), low metabolisable energy (8–9MJ/kgDM), and low crude protein levels (4–7%). In general, the later the hay is cut, the higher the yield and the lower the nutritive value. Mixed cereal–legume hay usually has higher energy and protein content (about 12%) than cereals alone, and is more palatable to sheep compared to grass-based hay. High protein hay (lucerne, about 18%) is particularly valuable as the roughage component of a diet for lactating ewes and growing lambs which have a higher protein requirement than dry adult sheep. Hay is usually a component of a diet for sheep and will need supplementing with grain or pellets. Always check bought-in feeds for weed seeds and the possibility of annual ryegrass toxicity. not recommended in diets for young growing sheep or lactating ewes; good quality roughage is preferable. Straw quality can vary greatly. Straw low in protein and energy are generally unpalatable and the levels of dust and odour may affect palatability. Barley straw is highest in energy, followed by oats then wheat, although all are low. Cereal straw is low in crude protein, with most levels less than 5%. Grain legume straws are higher in protein but lower in energy than barley straw. Energy is the most important nutrient to consider because it is generally the most limiting during a drought. pasture establishment in the following year may be improved by stubble removal. Leave enough standing stubble in the paddock to protect the soil from erosion. Bale straw as soon after harvest as possible to reduce the loss of fine leaf material. The proportion of fine to coarse material has a large influence on straw quality. If the baling method loses much of the fine material and includes the coarse stem, the quality of the straw will be low. Baling straw is best done at night or early in the morning before it becomes too brittle. However, straw baled too moist can become mouldy. If the straw is unpalatable to stock, treatment with molasses may improve its palatability. The poor protein value of straw can be improved with the addition of urea-based products. See Alternative feed sources for sheep for more information on this treatment and other novel feeds.